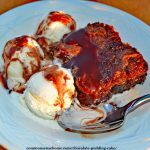 Mom's best hot fudge pudding cake is an easy from scratch chocolate pudding cake recipe combines two desserts in one – rich chocolate cake and yummy chocolate fudge pudding sauce. This is not a poke cake. It gets layered by itself, right in the oven. It's great paired up with ice cream or some nice cold milk. To make the chocolate pudding layer of the cake, you pour a liquid mixture over the top of the cake batter before cooking. Some of you may recognize this technique from the rhubarb pudding cake recipe. It's a little quicker prep time than homemade chocolate pudding, which requires stirring on the stove top. 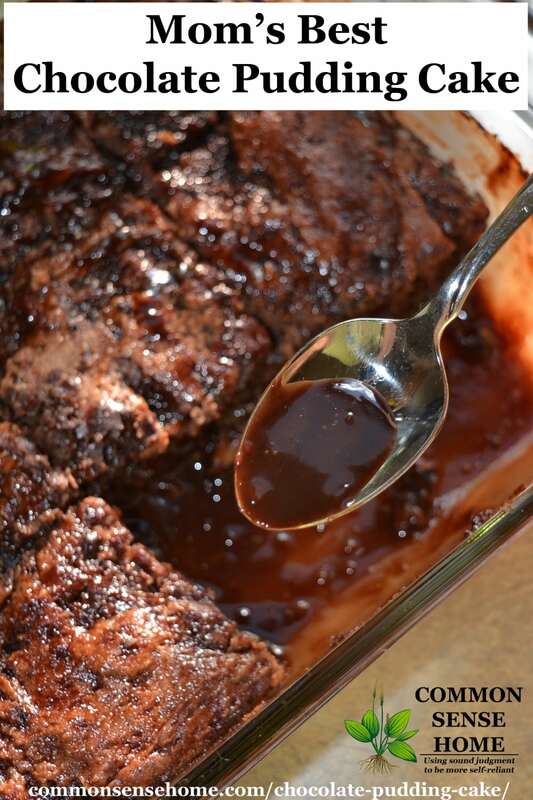 This homemade chocolate pudding cake recipe is made from scratch with common pantry ingredients. No cake mix is needed. Preheat oven to 350°F. Grease a square 8 inch pan. 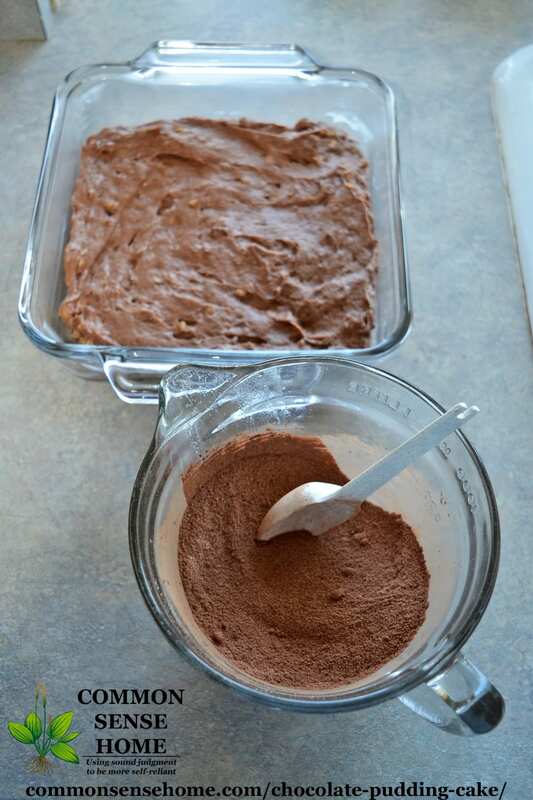 For the chocolate cake: Sift together flour, 3/4 cup sugar, 2 tablespoons cocoa, baking powder and salt. In a medium bowl, combine butter, milk, vanilla and chopped nuts. Mix dry sifted dry ingredients into wet ingredients. Beat two minutes and pour into prepared pan. For the chocolate pudding layer: Blend together 1 cup sugar and 1/4 cup cocoa. Stir in hot water and whisk until well blended. Pour gently over top of cake batter. Bake chocolate pudding cake for 35 minutes, until most of cake looks firm and pudding bubbles around edges. Cool a few minutes to allow pudding to thicken. 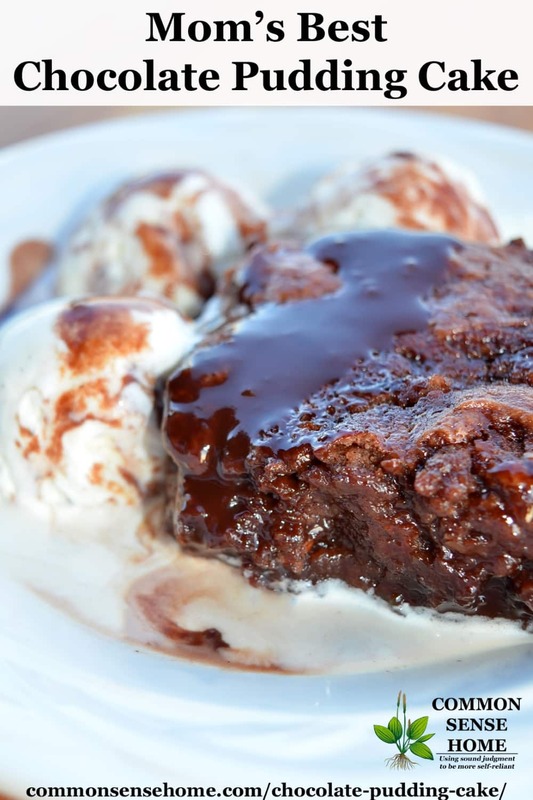 Serve while still warm for “hot fudge” pudding cake, or enjoy at room temp or chilled chocolate pudding cake. Leftovers, if you have any, are best stored in the refrigerator and eaten within a couple of days. You can see the pudding layer in the bottom of the pan in the photo below. My mom was a baker. There was always some homemade treat on the table – except when her six kids polished it off. Even as she got older and the kids left home to have families of their own, visitors could still count on a cup of coffee and some homemade goodies. Some people are surprised to find I have recipes with white sugar and white flour on the site next to low carb and low sugar options. Kolaches, cinnamon rolls and deep dish pies are the fare that brings back happy family memories from my childhood and my mother. For mom, cooking from scratch was a way to show that you cared. I feel the same way. Now we simply mix old and new, remembering family traditions and adding traditions of our own. Plus – if you share with a group, no one goes into a sugar coma. If you enjoy baking from scratch, check out my cookbook featuring a mix of recipes old and new, “Never Buy Bread Again – 20+ Homemade Bread Recipes“. It's dedicated to my mom, gone but never forgotten. Sourdough Brownies – These are great for using up excess starter that is not completely active. Chocolate Chestnut Brownies – Brownie option that's lower in carbs. 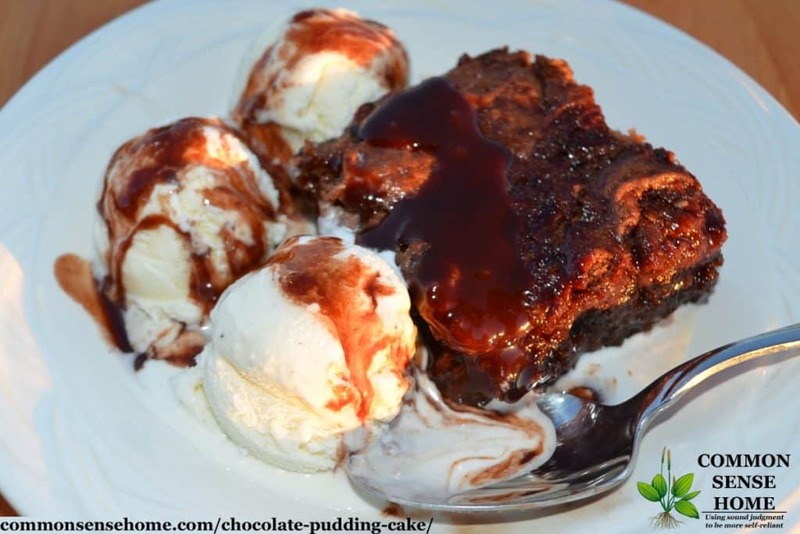 This easy chocolate pudding cake recipe combines two desserts in one – rich chocolate cake and decadent chocolate fudge pudding.